Railways have always been the backbone of India’s economic development. It is one of the largest transportation and logistics system in the world.Suresh Prabhu, the Indian Railway Minister is trying to fulfill all the commitments made during the Rail Budget 2015-16 in an effort to provide better passenger service. Suresh Prabhu is planning to bring in new coaches to enhance passenger amenities with better fire service measures. These new coaches have modern interiors which give you the feel of an air travel thus changing the travelling experience.The old coaches are more than 15 years old and are being renovated at the Carriage Rehabilitation Workshop at Bhopal. 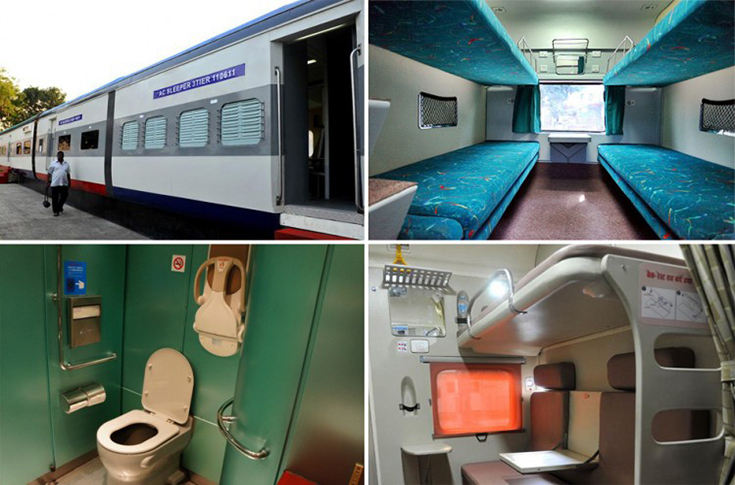 New coaches have features like controlled discharge water taps, new toilet modules, exhaust fans, LED lights and snacks table for side berth passengers. Presently work is ongoing in 24 of the coaches which include 1AC, 2 AC and sleeper coaches.The estimated cost of renovating 111 coaches would be around Rs 31.5 crore. The route for these trains with new coaches has not been finalized yet. IR is in the process of launching e-catering services with the objective of providing its passengers the facilities to book their meals on trains. IR is also working on the cleanliness in the trains as the new system of mechanical laundries has helped a lot. Besides there are also on-board cleanliness services available, where in if a passenger feels that a place is unclean, he can send a sms and the railway staff will get it cleaned. Indian Railway plans to increase the speed of the existing trains in a phased manner and there are also plans of installing CCTV cameras inside trains and stations.Train Speed on nine of the corridors to be increased to 200 km/hr thus increasing the average speed of trains. Several new trains were flagged from Howrah station in Jan 2016. Another major area where the railway has progressed is ticketing, as there has been a major improvement in the website of the IRCTC for online bookings. In today’s digital India around 60% of the tickets are purchased online through IRCTC. Recently Mr Prabhu inaugurated a new portal for Indian Railways for E-Procurement and E-Tendering, developed by the IT arm of Ministry of Railways. The facility will help create and publish tenders online. This new portal will bring transparency and efficiency in the tender process thus saving cost, time and providing easy access to information. Since Mr. Prabhu has become the Railways Minister, IR has upgraded its IRCTC website, launched paperless ticketing, provided private catering in running trains andprovided hygienic water at stations. Indian Railways has finalized 400 major stations across the country to be developed like the airports with double decker entry-exit and food court facilities.Suresh Prabhu is also trying to arrange Google Wi-Fi connectivity to nearly 100 major railway stations all across the country and will later be extended to 300 more stations. The ministry is trying to ensure better customer experience for all travellers who take the trains at the stations. Indian Railways to setup mobile charging facilities, in all train coaches including general coaches. 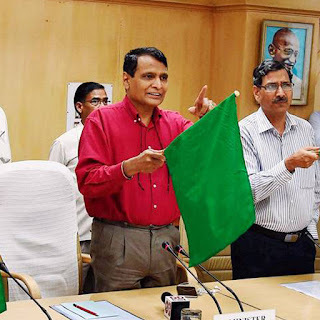 Suresh Prabhu recently flagged off the first double decker Shatabdi train from Goa to Mumbai. First of its kind, the fully air conditioned train would help tourists to visit Goa. Around 60,000 coaches under Indian Railways are in the process of being provided with user friendly dustbins. Both AC and non-AC coaches will be provided with two dustbins each at both ends of the bogie. Water wending machines will be installed on stations to arrange drinking water for the passengers.There are also plans of increasing the bio toilets and vacuum toilets like airplanes in trains. He also plans to implement ‘Operation 5 minutes’ wherein a passenger travelling in unreserved coaches can purchase a ticket in just 5mins. He also plans to launch a IRCTC mobile app for the purchase of unreserved tickets. Suresh Prabhu has also promised to launch air conditioned local trains in Mumbai. This would come as a major relief for commuters in Mumbai. The ‘Swach Bharat Abhiyan’ scheme has been launched on a large scale and professional agencies to train cleaning staff on 650 major stations.One hopes that all promises made by Rail Minister will be fulfilled in the years to come and the whole Indian Railway System will have a transformed look.